Re: Usnuspstrasp - Return of the Dwarves. Okay, we have the settlers' preferences here if anyone wants to be dorfed. Tobul Tholfikod - a miner and an engraver for me, please! I would like to claim Id Dumatlar. I would suggest making him a proficient armor smith, novice dodger, novice discipline, and 3 ranks in swordsman. I would like to be a farmer as well. No need for skill points, I'll learn. Interestingly enough Id already is a farmer but yes, consider yourself dorfed. Please dorf me as Erib. If you need a miner, I'd like to be that. They always encounter the interesting underground stuff first, and when you no longer need diggers, miners always make useful military recruits. I see no difference between these two phrases. Just finished the first year, I should have it posted later on. Apologies for lack of screenshots when it's posted, I had a power-cut and lost most of them. Journal of Sodel "Comicraider" Kalanfikod. We've arrived...but I have no idea where we came from. Two weeks ago I woke up in the wilderness with six complete strangers, none of us seem to have any recollection of what happened to us, as if we just sort of came into existence. Hangovers aren't fun. The nearby hillocks were all devoid of life, seemingly having been abandoned for centuries. Even the capital, the fortress of Gladgold, was derelict, save for the sounds of roaring from some unknown creature, but none of us wanted to find out what it was. Upon leaving the fortress me and my companions came across a blue jay woman, seemingly a travelling bard. Before we could ask her what happened to the Dwarven territories the creature stared at us, wide-eyed and confused, asking us where we came from. According to her, our people were wiped out hundreds of years ago by the Goblin empires that ruled Usnuspstrasp with a Goblinite fist. Could this be true? Are we all that's left? What happened? Unwilling to accept the truth that we could be the last seven dwarves in existence, we pressed on and travelled east, following our new friend's advice and going into hiding before our knife-eared overlords caught wind of our very prescence on this earth. Eventually coming across a seemingly peaceful place to settle we began to build, hoping this place would become a safe haven for us and any other survivors that may or may not be out there. Sunshield. 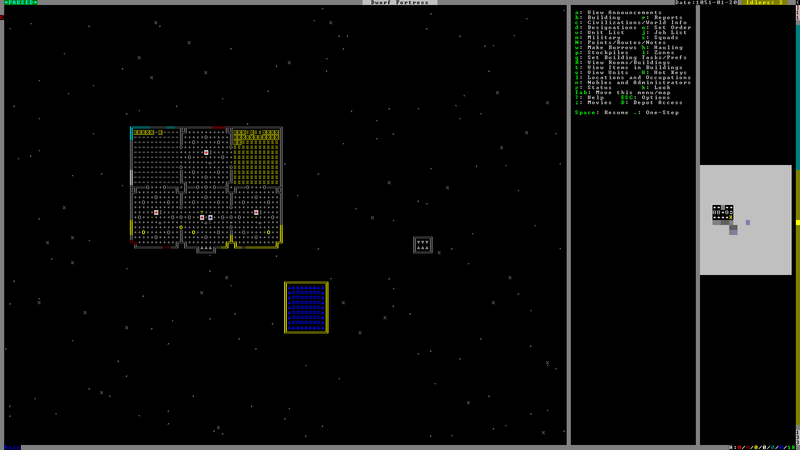 The last Dwarven refuge. We've finished basic housing for ourselves, and built a large gate so we can seal ourselves inside in the event that we're discovered. Once the farms are built and we have water running underground we should be relatively self-sustaining. 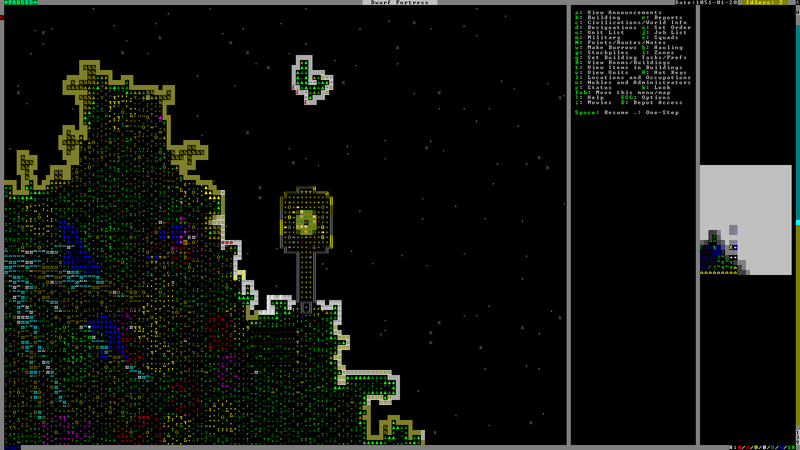 Armok be damned, I need a drink. Here's hoping our farmer, Id "Justin" Dumatlar, gets the still finished soon. Migrants! We're not all that's left after all! Early this morning we had a group of eight refugees, one being a child, arrive at our doors. Like us, they seemingly woke up with no memories. According to the child's father, Zasit Southplank, even his daughter's birth is shrouded in mystery, having no recollection of a wife. He just woke up and recognised young Ezum Daggerequals as his daughter. We welcomed our stranded brethren with open arms and provided them with rooms, it's a few more mouths to feed but who can put a price on their species' very survival? One of our two dogs, Besmar Idilrom, hasn't been seen for a few days. We only had a breeding pair of dogs so I'm a little worried. Young Ezum Daggerequals ran into my office in a panic today, claiming she found Besmar dead near our wagon covered in stab wounds. I sent a group to investigate and now we're all nervous; was this a native animal-person, or were the Goblins onto us? We sealed the gate that night and doubled rations for everyone just in case, this whole thing has left us all on edge. We're in a fairly good place right now in terms of surviving. Justin has been working overtime to make sure we had enough alcohol and food to last a while, so now I can end the rationing, that should put a smile on everyone's faces. We also channeled the stream underground and into a reservoir, meaning we have a constant water source in the event that we have to seal the gate for a long period of time. It's strange being self-sustaining all of a sudden. 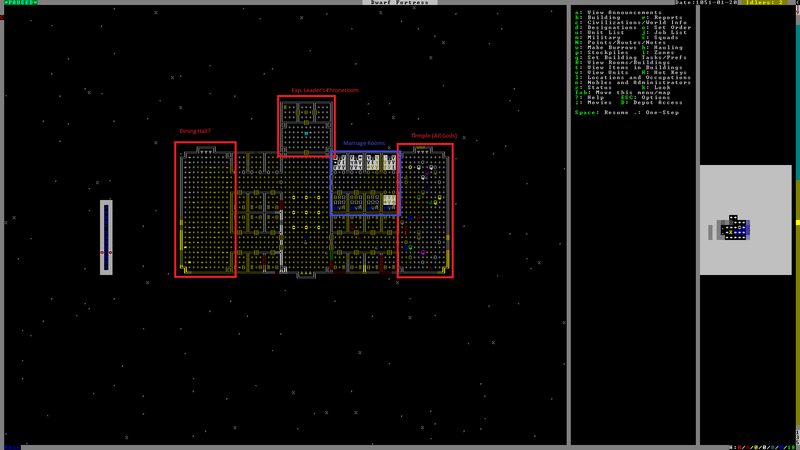 Another group of Dwarves arrived at our outpost today, this time a group of travelling merchants. Like us, they could tell us nothing about how we all survived extinction, but they managed to keep a low enough profile to gather supplies from the Dwarven ruins and come here undetected hoping to trade. We gave them a handful of Avuz Oddomurmin's freshly-cut gems and some mussel shell crafts in exchange for some fabrics and they went on their way. Shame, if I had any idea they were coming I'd have gotten more for them to take. I gave them a handful of extra gems and a mug of sweet potato wine each, hoping they'd come back soon. I hope they survive out there. More amnesia-ridden refugees, this time only three newcomers. We had beds ready just in case more stragglers arrived, but I now have a feeling in the pit of my stomach that this is everyone that's left. Luckily we got a few furnace operators among these recent arrivals, so they've been working around the sundial with our blacksmith, Cerol Bomrekazin, to smelt all the gold we've been digging out. I doubt money will do much at this point, but who doesn't want to die rich? Next up is all the iron, we'll have to arm ourselves...just in case. The last few months were uneventful, beyond finishing digging out a temple nothing of note really happened. I gathered everyone in our place of worship for a few minute's silence, both in celebration of one year since we all awoke and in remembrance of our fallen brethren and any family we may have had, all seemingly long-since dead. We're all there is, a small enclave of 18 dwarves being the last remnant of our entire race. I stepped down as Expedition Leader shortly afterwards, having finished my year and passing the reins onto Kol Nazomled, one of our farmers. Unexpectedly, I was handed a pond turtle shell crown and declared the new queen of The Allied Helm, the first in almost nine hundred years, and possibly the last if we don't make this work. While I'd like to joke and demand a lavish throne room covered in Microcline and Brown Zircon, we have more pressing matters; if we're all that's left, we'll have to increase our numbers the old fashioned way. I'm ordering construction of "pre-honeymoon suites" as I write this. We've finished three of these suites, all covered in fine engravings and decorated with the finest furniture and masonry that "Lunardog15" Kolbisek, Bembul Zegdatan and "Kametec_Houston" Tholfikod could produce. Hopefully we'll see some weddings soon. 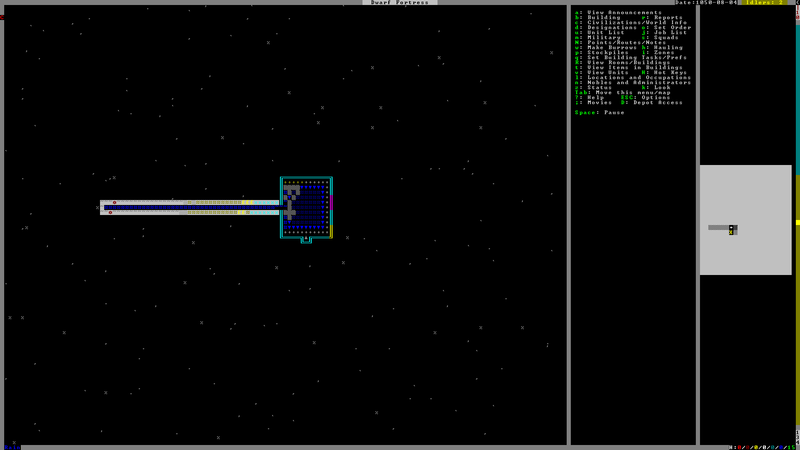 While I've stayed a few days later than I planned, now's time to pass the oversight of the fortress onto another. May you improve on my work and guide our people into prosperity. I have received the save. When I'll have time later today, I'll start by reading the update above and then I'll start my own turn. I've also noticed that 44.10 is out. I guess I'll test if the save is compatible. Provided there are no issues, I'd suggest upgrading. It is? I'll go download it now I think it'll just be memory improvements, seeing as our dwarves are in a tricky situation I imagine negative thoughts will end up causing issues especially with a few of the citizens having grudges already, but I don't think it'll be anything tantrum-worthy. So, okay. It is 17th Granite today and queen comicraider has appointed me as an overseer for a year. Can't say I'm happy about it, but what can I do? Get drunk and get it over with. There is a lot of work. I've never been an overseer before, so I'll have to learn the ropes on the fly. As far as I know we could be the last dwarfs alive and we cannot afford incompetence. Now what should I do... I know! I'll start with familiarizing myself with current state of things as closely as possible. Now let's see. What is everyone doing I wonder? I'll look around and see what I find out. I did some digging around, questioning and a couple of inspections. Results? We're busy with praying, meditating and whatnot! Well, except me, of course, I'm a proper dwarf, I get things done. Look at me. 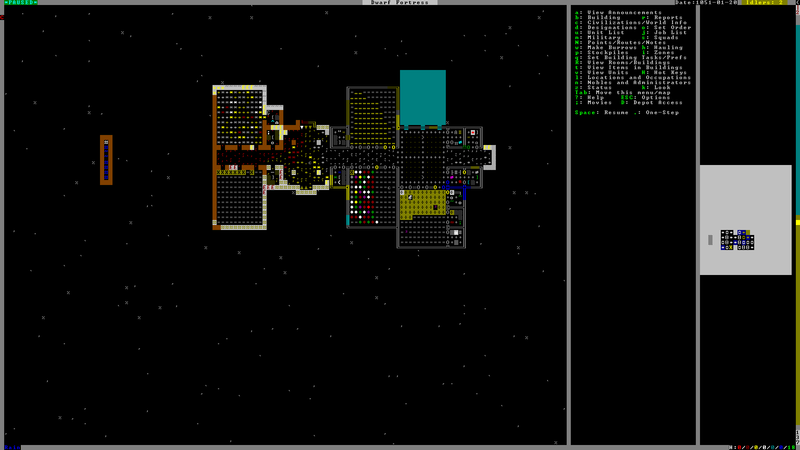 I am a worshipper of Creature of Beards (as every proper dwarf should be), but do I waste my life away at a temple? Nope! I do hope that this bunch of temple goers will get out of the temple once I assign some work to be done. Actually, is there really nothing to do right now? Crafts to be prepared, booze to be brewed, food to be cooked? What is in our stockpiles again? Let's see. I'll ask our queen about it. She doesn't know? What does she mean, doesn't know? Estimates are okay enough? How are estimates okay?! Let's see how are estimates okay enough when we'll get to designing magma heating for royal suite. Anyway, I've decided what I'll do now. We need a bookkeeper. And a manager. And possibly a chief medical dwarf. My first deed will be appointing those. Do we have any volunteers for vacancies in administration? I'm looking for a bookkeeper, manager and chief medical dwarf. If you want your dwarf to take up the job or just be dwarfed as one, let me know. Otherwise, I'll just decide myself. I would like to be dwarfed as Ber Oltarazin please! I would also like a turn in the succession game if the wouldn't be too much to ask? And seeing how you're worried when unable to help others, being perfectionist and find helping others very rewarding, you're a prime candidate for chief medical dwarf. There will be benefits! Like own office in hospital.